Patients at a high risk for developing lung cancer may be eligible for a lung cancer screening CT scan. The purpose of this test is to look for lung cancers and catch them at an early stage when they can be treated more effectively. Some patients, depending on their type of insurance and if they meet certain age, smoking history and current health requirements, may be covered for a lung cancer screening CT scan. This low-dose chest CT scan is performed here at BMC. 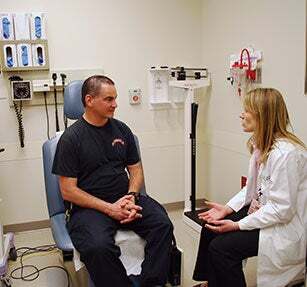 Before scheduling a screening CT, patients must speak with their primary care physician or one of the physicians at BMC's Lung Nodule Clinic about the risks and benefits of this test and whether lung cancer screening is right for them. Please ask your doctor for more information. Pulmonologists (lung doctors), nurses, and health navigators in BMC’s Lung Nodule Clinic work together with patients and their primary care providers to develop an individualized plan to evaluate lung nodules. Lung nodules show up on an X-ray or CT scan. Most are harmless and cause no problems, but a small percentage (fewer than 5%) turn out to be cancer. The team tailors a management plan that is unique to each patient, based on the best studies available. Sometimes, this involves monitoring lung nodules to see if they change in size over time, and other times, a biopsy or surgery may be recommended for the lung nodule. The Lung Nodule Clinic also provides counseling about the risks and benefits of lung cancer screening. The purpose of lung cancer screening is to find lung cancers at an early stage when treatment may be more effective. BMC’s specialists can help to determine if this test is right for each individual.